At the Mobile World Congress in Barcelona, LG has unveiled yet another phone: the LG KF600. The InteractPad is the most innovative feature of the LG KF600, it replaces the navigation keys and has a multi-sensorial feedback which vibrates and makes a "clicking" sound when pressed. 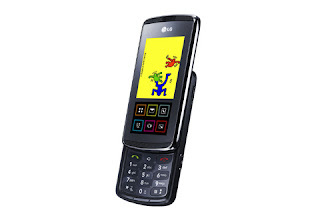 The LG KF600 is a thin slider phone and has a 3 mega pixel camera, FM Radio, Bluetooth, and a multimedia player. In effect, the LG KF600 has two screens, the larger 2 inch screen is the regular display while the 1.5 inch screen below houses the InteractPad. According the LG, the LG KF600 will be available starting January. Check out this LG KF600 Review.